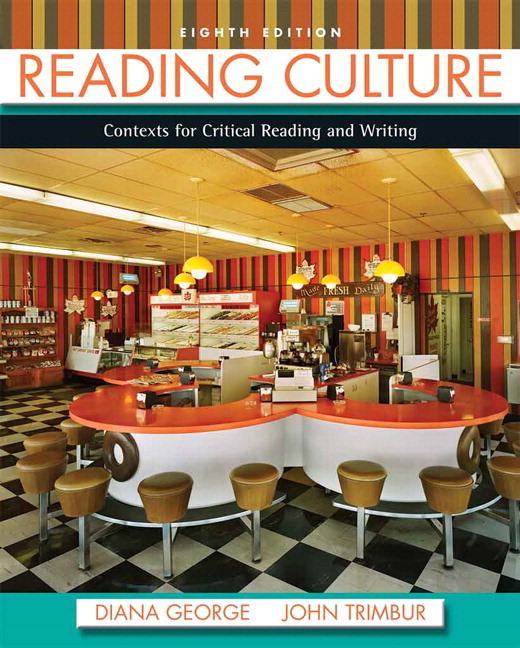 Acclaimed for its compelling readings and provocative images, Reading Culture provides students with outstanding instruction on how to read and write critically about the culture that surrounds them. Written by two highly respected composition theorists, Reading Culture asks students to examine how culture organizes social experiences and shapes our identities. From analyzing texts and historical documents to conducting fieldwork and mini-ethnographies, students are invited actively investigate culture using cultural studies methods. The first cultural studies reader to also address visual literacy, Reading Culture features a striking four-color format and includes visual and verbal texts of diverse genres, including more than 100 images of posters, advertisements, photos, and art. Always up-to-date, this edition represents a significant revision with new readings, features, and visual images to help students gain the necessary critical thinking skills to observe and analyze a broad range of cultural phenomena. Readings examine timely, noteworthy cultural issues, such as: how the digital revolution impacts contemporary culture, the millennial generation, gender, films, fashion and advertising, race and ethnicity, public spaces, memoir and storytelling, the overworked and underpaid American worker, and working and living in a global economy. Superior pedagogy gives students analytical tools to think and write critically about the readings, images, and ideas presented in the text. Through the chapter introductions, contextual headnotes, and questions that accompany individual reading and visual selections, students are asked to identify the purposes and assumptions writers bring to their works and the rhetorical patterns they use to enact those aims. “Visual Essay” segments present a wide variety of topics including examples of commercial and public service ads, public health messages, product labels, posters, graffiti, graphic novels, images of street fashion, youth culture in movies, and graphic design in hip hop culture. Numerous assignments ask students to create their own visual compositions. “Making Connections” are paired readings in every chapter that offer differing views on topics such as memories of home and school, images of gender, theme parties, geek culture, roadside memorials, urban legends, sending the American Dream offshore, and historic speeches on race and racism. New Research Project sections at the end of each chapter provide two major assignments that ask students to do research on the topics related to chapter's theme and present their work in multimodal formats. One of the assignments in each chapter focuses on primary research via interviews, observations, questionnaires and oral histories, and the other assignment sends students to historical archives, museums, and special collections to examine newspapers, comic strips, government documents, and textbooks. A completely revised Chapter One, “From Page to Screen: Are New Media Rewiring Us?”, provides an opportunity for students to think critically about the writing they've done in the past, in and out of school, and to analyze the range of purposes reading and writing enact. A Case Study in Chapter 1 also asks students to think about the impact of the digital revolution on contemporary culture and how a number of writers are trying to make sense of new media’s influence on the way we live, and a sample student paper demonstrates how the results of research on the digital revolution might be represented. A new "Research Projects" section concludes each chapter, featuring two major research-based assignments with guidelines for carrying them out and suggestions for presenting the results of the research that students are doing. Reading Culture has always featured a wealth of research-based assignments that ask students to touch and examine culture for themselves and make use of various cultural studies methods. This new "Research Projects" section in each chapter highlights and expands the options for research activities and also introduces new possibilities for multi-modal composing. One of the Research Projects in each chapter often asks students to practice "fieldwork" methods, such as ethnographic interviews, participant observation, semi-structured interviews, and oral history; while the other Research Project in each chapter asks students to rely on library, online, archival, and other sources. New assignments throughout the book offers increased opportunities for students to design multimodal compositions and to present their work in a wide range of ways–photo essays, digital slide shows, illustrated essays, CD liner notes, PowerPoint, timelines, Wikipedia entries, brochures, Web sites, panel presentations, and museum exhibits. Expanded and updated Visual Essays, including eight new Visual Essays, provide opportunities for students to read and analyze a variety of visual texts, examining such topics aspage design in books, photo essays, graphic novels, and double-page spreads in magazines; Hollywood icons; gender roles in advertising; women boxers; hip hop CD covers; Banksy’s graffiti; labor murals in Maine and Chicano murals in California; M.I.A.’s graphic style; and the work of Coco Fusco and Guillermo Gomez-Pena, Samuel Fosso, and Wang Qingsong. Chapter 1: From Page to Screen: Are New Media Rewiring Us? Case Study: Are New Media Rewiring Us? Making Connections: What Has Changed?